A midwife rakes in an extra R153 000 a year by selling homemade placenta products – including face creams, keepsakes and smoothies. For the past two years Ciara Noble has been collecting fresh placentas from new mothers and transforming them into capsules, essences, face creams, creative keepsakes and even raw smoothies at their request. The 23-year-old from Melbourne, Australia, became a certified Placenta Remedies Specialist two years ago after researching the benefits new mothers may experience from consuming their placenta. After launching her business Kindred Postnatal Products in January 2017, Ciara has started raking in an extra R153 000 a year, selling her placenta products to many women. Ciara, who works full time as a midwife, runs her business on the side – with the extra income even helping her fund a dream holiday to New York earlier this year. Ciara says although some people might be turned off by it, it’s a natural and beautiful thing. “You have this organ that’s kept your baby alive for nine months. It’s so important and so special. Ciara says her most popular service is placenta encapsulation, which is believed to help with energy levels, hormone imbalances, reducing post-natal bleeding and increasing milk production. Although less common, another method of placenta consumption that the midwife offers is to whip up a smoothie made from fruit, coconut water and fresh raw slices of placenta – which is said to provide an instant energy hit. “Once I get the placenta I cut it into thin slices and pop it into the dehydrator for 15 hours, the same as if you were making beef jerky or dried fruits. “Then I’ll put all the slices in a blender and whizz it up into a powder. I have a pill-making machine that makes it all into little capsules. “Some women are a bit concerned about an aftertaste, so I can add flavours such as bubblegum, lime or strawberry, which help mask it. “The placenta smoothies are meant to be potent and full of nutrients, as it’s done raw. You don’t kill any of it from the dehydration, and you’re putting back what you just birthed. “I’ll either go to the hospital or their homes and make it for them within 12 hours of labour. 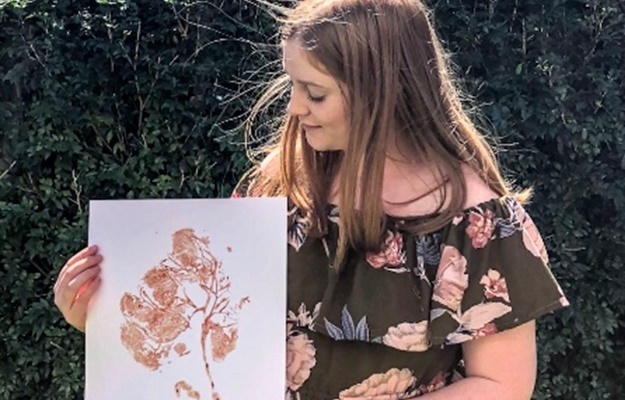 Ciara also creates artistic keepsakes such as placenta-blood prints and little ornaments made from the umbilical cord, which she fashions into different shapes. “I absolutely love doing the little keepsakes as an extra thing. I don’t charge for them, I just think it’s really nice to give it to the new mothers as an extra surprise. Ciara said she never actually meets the mothers who buy her products, but rather simply collects the placenta from the hospital and then returns within 48 hours with the finished goods. She doesn’t have children yet and says said she’d definitely get the whole works done with her placenta when she becomes a mother one day.